Besides the typically Dutch Dried Flowers, we have an extensive range of imported Dried Products from other countries. Different kind of fashionable branches, fruits, pine cones on sticks. These products look very good in combination with Dried Flowers, decorative objects as well as fresh flowers. For this assortment we offer two catalogues. Dried & Bunches with a year-round assortment and X-mas Bunches with a special Christmas assortment. This product range is constantly updated and can usually be delivered directly from stock. Check out the complete range in our catalogue. In addition, we invite you to visit our showroom. Besides related Dried Flowers we offer a wide range of other natural decorations. We will be happy to discuss this with you and develop bespoke items. All products have a natural base. 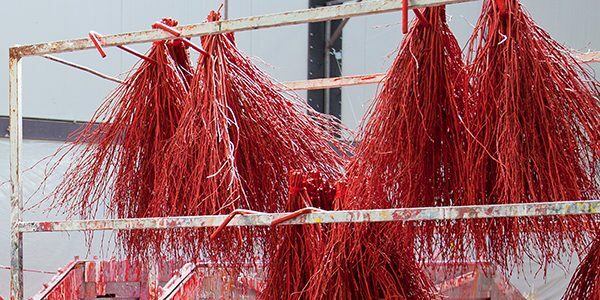 At Lamboo Dried & Deco our professional drying facility gives us the ability to add value to every product. Added value like dyeing (colouring), glittering, snowing, frosting, scenting and spicing. In this way we can ensure quality and a quick and flexible response to the demand of our customers. The materials (dyes) we use are certified and water-based systems. Our wastewater is cleaned in our own water purification plant. Because of the environment we work on developing bio-degradable glitters.